The most stressful situation after you investing in the stock market occurs when there is a reduction in the price of your stocks. Investors fear that they will lose all of their money if the market falls and surely enough, losing money is stressful. 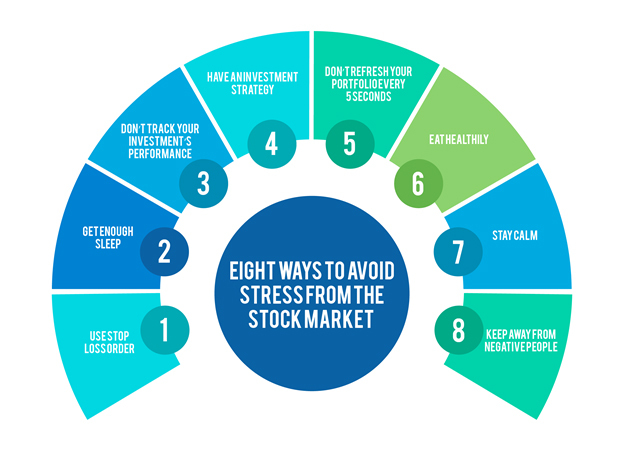 When you invest your hard-earned money in the stock market, it is justified that you feel a little stressed and insecure as there is a chance that you may incur a loss. However, the worst thing is the negative influence this stress can have in your everyday life. 1. Use stop-loss order: The most stressful situation after investing money in the stock markets is when there is a reduction in the price of your stocks. Investors fear that they will lose all of their money if the market falls and surely enough, to lose money is stressful. A stop-loss order will allow you to automatically sell the shares if they fall below a certain price level. It will give you a peace of mind that you will not lose all of your money and will help you to avoid stress. 2. Get enough sleep: Getting a good night’s sleep is the ultimate stress-buster. An adult should sleep for at least 6-8 hours every night. If you're getting less than 6 hours of sleep, you will get easily frustrated while trading in the markets. Being sleepy and frustrated can result in bad decisions, and you can incur significant losses in the market. How you react and respond towards the share market is directly related to the number of hours you sleep. 3. Don’t watch your investments continuously: Sitting in front of the computer and watching your investments dive is always stressful. While it is true that you should regularly monitor your investments, it doesn’t mean that you should sit in front of the computer screen the whole day. Set a specific time to monitor your investments. When you think the market is not going your way, it is best that you just close the computer and do something else which you find interesting. 4. Have an investment strategy: Trading without an investment strategy is like running through a field of landmines with your eyes closed. You are bound to suffer losses without an investment strategy. Before investing, always come up with a strategy and make efforts to stick to it every time you trade. It will allow you to increase your profits and cut your losses. And there would be no reason to feel stressed as you will be booking profits in your investments. 5. Don’t refresh your portfolio every 5 seconds: Is the market not going how you thought it would? There is no point in watching your investments lose ground and feel sad about your fate. Refresh your portfolio balance once a day and not every five seconds. If you are losing money, there is nothing you can do about it. Put a stop-loss in your stocks and forget about the market not going your way. 6. Eat healthy: Don’t ignore your physical health as it directly influences your decisions. If you eat healthy food, your body will feel fully balanced, and you will make better investment decisions. Avoid junk and unhealthy foods as they can deteriorate your health and you will react negatively towards the investment process. A healthy body means a healthy mind, and a healthy mind is all you need for making good profits in the market. 7. Stay calm: Panicking during a downtrend always leads to bad investment decisions. Stop, relax, think, and then react to every difficulty you face while investing. Taking a decision in a hurry is the main reason investors lose out on big profit-making opportunities. You can even try meditating while going through a rough day. Always keep in mind that whatever be the challenge, only a calm mindset will allow you to conquer it. 8. Keep away from negative people: You tend to act like the people who surround you every day. Analyze them, see how they handle stress when they are facing a challenge, and if have a positive outlook on life. If not, try keeping away from them as they will only add to your stress. If you want to avoid stress while trading in the market, you have to surround yourself with people who have a positive mindset.